I had originally planned on publishing this post on April Fools Day, but in light of the prescient news revealed a few hours ago, I am publishing this post today. I swear I had the idea for this post well before today’s announcement (last August, actually). The Saint Louis Zoo announced, today, plans to begin its first major expansion in its 100 year history. Enabling the Zoo’s plans is a contract to purchase the Forest Park Hospital site. 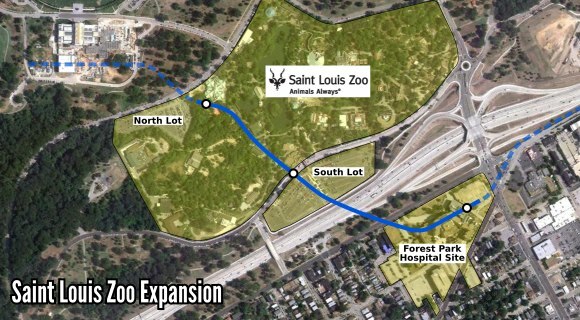 As the Forest Park Hospital site is separated from the Zoo by Highway 64/40, Zoo officials envision building a 1/2 mile, 3 station monorail to ferry Zoo patrons between the Forest Park Hospital site and the north and south Zoo entrances. In addition to more parking for visitors, Zoo officials plan on building a five story office building at the corner of Hampton and Oakland. The building will have retail on the first floor and house Zoo-Museum District offices in the remaining space. Zoo officials say that they are quickly running out of office space and while the new building is too big for their needs, they will share the space with the Art Museum and Science Center. In the near future, Zoo officials envision expanding the monorail a quarter-mile north to the Art Museum and, eventually, a mile east to the Science Center, thus connecting the top 3 attractions in Forest Park. Farther into the future, the monorail may be expanded to the BJC medical campus where a connection to the Central West End MetroLink station would provide a significantly easier and quicker year-round ride to Forest Park attractions than what the existing Forest Park Trolley provides. Zoo officials say they are coordinating their monorail plans with BJC and CORTEX. The St. Louis Development Corporation, in conjunction with BJC and CORTEX, is currently studying ideas for a monorail that would run between Euclid and Boyle and perhaps as far as Cardinal Glennon Children’s Hospital. Its sad sort of that one of the other routes for metrolink at the time that cross county was being planned would have paralleled this monorail line, going south of the park, hitting the Science Center, Forest ParkCC, then the Zoo and Art Museum. Now much of the monorail or other transit concepts would now traverse that line. Thats assuming your monorail here is actually serious and not something made up for the story that would have run on april 1. This is awesome!!! Connect the monorail to EVERY attraction in Forest Park then expand MetroLink and create a bike sharing system and the city can be back on top again!! !